I mentioned here on Friday that, as in April, orders for DC's two "Button" issues of Batman and Flash would likely be split in reporting between the $3.99 lenticular and $2.99 standard-edition covers — and that posed the prospect that one or both of those issues would again edge past the reported top-seller, Marvel's Secret Empire, once orders were combined. That proved to be the case; click to see the comics order estimates for May 2017. 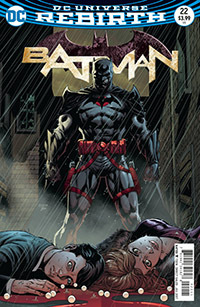 The original breakdowns are preserved in that list, but we can see that shipments of both versions of Batman #22 to comics shops in North America totaled nearly 186,900 copies (Edited: we'd initially used the numbers from #21), well over Secret Empire #1's total of more than 157,500. And Flash #22 hops up to second place, with a combined total of more than 163,700 copies. Again, the division of differently-priced variants is a long-standing practice in the charts; retailers, whom these charts are for, find knowing the breakdown of differently priced covers useful to know. That said, Comichron has launched a running top-seller list for the year to date, combining the data from individual months; this can be found on the main 2017 page. There, we do fuse the entries, as we've done for years on our Comics of the Century and other pages. The top dollar book on Diamond's charts, Venom #150, at nearly $6, would keep that status even if the Batman dollar orders were merged; Secret Empire #1 would remain the second-place dollar book. There's evidence of overshipping on the first two issues of All New Guardians of the Galaxy, which saw splits between their dollar and unit sales rankings. Meanwhile, the $9.99 Deadpool #30 is the seventh-highest dollar earner, while being only the 58th bestselling issue. 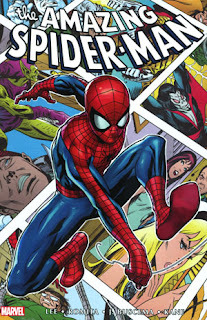 On the graphic novel side, Marvel's Amazing Spider-Man Omnibus Vol. 3 hardcover, at $100, was the top book in dollar terms. The dollar top-ten is populated by several other big-ticket books. There was some deep-discounting of older hardcovers evident in the charts, but not a whole lot; enough to contribute to the ten-point split in units versus dollars on Diamond's percentage change charts for the month. Diamond shipped 14% more graphic novels this May versus last, but only earned 4% more dollars. That's May. As mentioned on Friday, June of 2016 was a whopper of a month, and with one less shipping week no one should expect this month's numbers to top that performance. July will be our next real chance for a straight-up comparison.